The Commons' top official Malcolm Jack has said he was "startled" to hear an MP's office was being searched, as it was broadcast on TV. Mr Jack appeared before a special Commons committee looking into the police search of Tory frontbencher Damian Green's office in November 2008. He said the first he heard of it was when Sky News reported that an MP had been arrested and his office searched. "It was certainly a peculiar situation, I was very startled," he said. Asked if he should have been informed by the Speaker, he replied: "I can only say that I wasn't consulted." A cross-party committee headed by former Lib Dem leader Sir Menzies Campbell is looking into the issues around the arrest of shadow immigration minister Mr Green - and the search of his Commons office. He was held as part of a leaks inquiry but never charged - the police action, which involved counter-terrorism officers, was later ruled to have been "not proportionate". 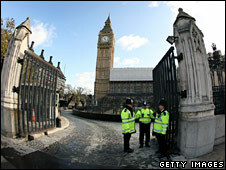 It sparked a political row as MPs were furious the police search had been allowed without a search warrant. Giving evidence Mr Jack apologised to MPs, saying: "I am sorry that this matter was not better handled." MPs were told his colleague, Serjeant At Arms Jill Pay, had spoken to police about the case before the search but had not informed Mr Jack. Mr Jack said he believed she had felt bound by confidentiality not to talk about it because counter-terrorism officers were involved, adding she was usually "very consultative". The day before the search she had raised the subject of whether she "had authority to permit the search of offices in the precincts", he said. But she had put it "so hypothetically that there was no context to it", he said. In hindsight he should have asked more questions, he accepted. Mr Jack was asked about claims made by former Commons Speaker Michael Martin to the committee last week, that he had suggested a senior police officer had "bamboozled the Serjeant and tricked her into keeping the matter from her immediate superiors" - a claim rejected by the Metropolitan Police. Mr Jack said he had "no recollection of using that language" but said he had intervened to say he felt the police had put "unfair pressure" on the Serjeant and "might have supported her better". He said he did not think police had spelled out - as required by Police And Criminal Evidence Act regulations - that she did not have to sign the consent form. But he said that did not mean the officer had intended to trick her: "They might not have done it for reasons of competence or incompetence." Speaker's Counsel Michael Carpenter said from his conversation with Ms Pay it was clear that the fact she did not have to sign the consent had not been made clear. "I wouldn't regard it as a deception or anything of that sort, I would regard it as an omission," he said.